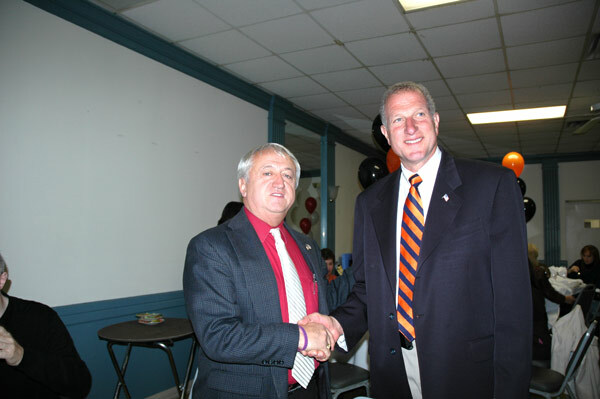 The 2011 luncheon was held at the Russian Lodge in Shelton on Tuesday, November 22. Both Shelton Coach Jeff Roy and Derby Coach George French spoke and introduced their players. However, the real highlight for the day was the speaking of the former members of each team who were the featured speakers. Dennis Wanzie, a former winner of the Silver Turkey Award and a current assistant coach at Shelton and Tom Able of Derby delivered nostalgic and motivational talks about their experiences, and ironically for the second straight year neither of the speakers won the game during their senior season.